I haven't participated in Saturday Night Genealogy Fun for the past few weeks, partly because I'm still unpacking mountains of moving boxes (will it never end?!) and partly because the themes weren't really up my alley. This week, however, Randy Seaver chose a topic that looked a little more fun to me. (1) Have you created a timeline for one of your ancestors using a genealogy software program (e.g., Family Tree Maker, RootsMagic, Legacy, Reunion, etc. 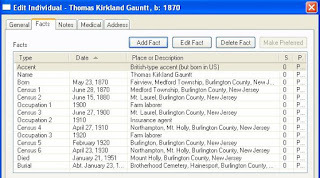 ), an online family tree (e.g., Ancestry Member Tree, FamilySearch Family Tree, Geni, MyHeritage, etc. 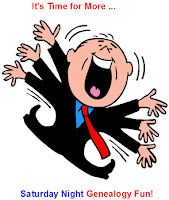 ), or a spreadsheet (e.g., Excel)? (2) If not, try to create a timeline using the program/Web site of your choice. If so, create another one for the ancestor of your choice! (3) Show us your timeline creation and tell us how you did it: which program/Web site, the process you used, and how you captured the images to display your timeline. (4) Share your timeline creation on your own blog post, in a comment to this post, or on Facebook or Google+. 1 and 2. I have created a timeline before. In fact, Randy used this idea in 2016, and I posted a timeline then. In addition, the program I use, Family Tree Maker, automatically creates a timeline with the facts that you enter about each individual. I created the timeline I'm posting tonight specifically for this exercise. 3. I use Family Tree Maker v. 16. 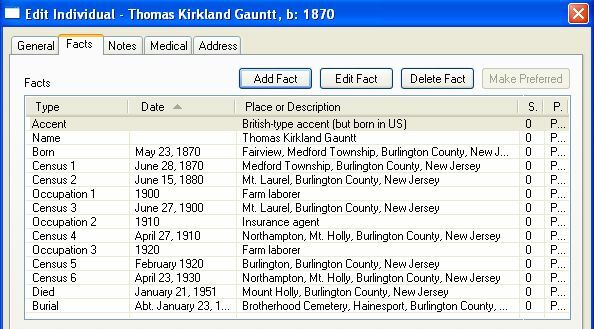 I created a Genealogy Report that included all the facts I had for my great-grandfather Thomas Kirkland Gauntt. I exported the information in an RTF file, then added additional facts and edited the file in MS Word. I copied and pasted the text from Word directly into this blog post. I have found that makes it easier to read, as opposed to doing a screen capture. As Randy commented, it's pretty plain, but the benefit of exporting the file and opening it in a word processor is that I can add as much information as I want to it.